This past weekend marked the end to my double digit long runs. It is funny to now refer to my 12 miler as a long run, but will be even funnier to refer to this Sunday's 8 miler as a long run. I put in 6 miles this morning and will be putting in two more 4 milers before my 8 mile long run this Sunday. Next week, the final week of my taper, will top out at 4 miles with a 3 miler and 2 miler wrapped around it. I am taking the taper serious even though it seems very strange to be running so few miles. I have been following Hal Higdon's Marathon Training Schedule: Intermediate II with a few slight modifications along the way to move my runs to make them easier to fit in my schedule, and also because I wanted to get a little past 20 miles for my longest run. The plan to get in runs past 20 miles didn't work out really good as I only got one 21 miler in, and the next time I was going to go 23 I was just not feeling it and couldn't push myself to the 23. I know I am fine since I did end up with 4 20+ mile runs, much more than most people run before a marathon.... especially their first. I am very excited but right now it is not sinking in as I have a lot on my mind. Our oldest Daughter Ashlee who is in Color Guard has her last Football game this Friday night (which we are chaperoning for), and then our Daughter Payton will be running in the State XC Meet this Saturday. Once I get past this week I am sure it will start sinking in much more. I am starting to think about some logistics like what to wear, what to take, what to eat...... should I get some throw away gloves and hat incase it is a little cool at gun time..... All kinds of things starting to go through my mind. 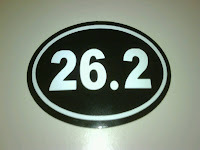 I received my 26.2 car magnet in the last couple weeks. I had to really search to find the white letters/black background as most of them are the other way around. I am so looking forward to putting that on my car. Even though It has been almost 2 years since my first 13.1 I never felt the need to put one of those magnets on my car..... not sure why. Here's to the last 10 days/25 miles of my 26.2 Quest! Tim, I'm getting excited for you! I can't wait to hear about you experience when you cross the finish line. It is a powerful feeling - I've done it 7 times now, and it never fails to make me overcome with emotions. You get one of my miles at Richmond, I will be running 26.2 as well on the 14th! I'm really looking forward to your race report as well. It's going to be great! hope you are enjoying your taper! the cutback in miles is very weird to deal with, although sometimes the little extra free time is quite welcomed! Good luck! Don't let the taper get you too crazy...luckily you seem to be busy enough so you won't be doing silly things like checking the weather report every 30 minutes (OK...perhaps you'll start doing that soon). Good luck with the taper Tim and congrats to Payton -- tremendous achievement! wow, good luck to you! I just put a 13.1 sticker on my Jeep, to commemorate my first half! I'm contemplating a full, so I'm going to check out some of your past posts. Having a plan in place for race day is important. So it's good you're thinking about this stuff. I always take throw away clothes. You can get cheap gloves, scarves, etc at a dollar store, even. But better safe than sorry. You can waist a lot of energy shivering before the gun even goes off. Good luck, you're going to do great!